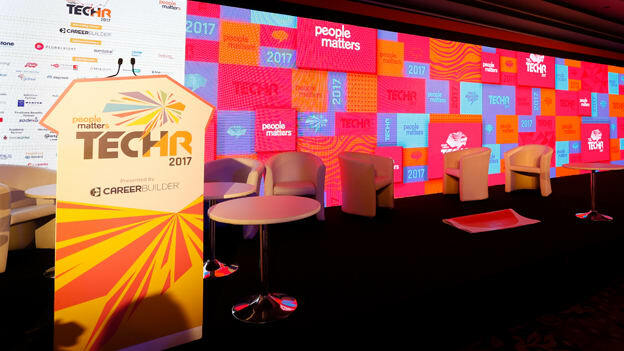 People Matters TechHR is Asia’s largest HR Technology conference for a reason. On day 1, as one entered the venue the scale of the conference was evident right at the entrance. With five parallel tracks on the agenda, there was a lot happening on day one. In this digital age, we have so much choice and so limited time; this was beautifully captured in the day one agenda. One had to choose, prioritize and move between venues and topics to make the most of day 1. So it’s humanly impossible to attend everything that happened on day one, but I present some of the sessions that I attended and the highlights of the day for me. The theme of day one was performance. For me, it meant to immerse myself into this experience, be present, be aware, make decisions and perform. This meant moving from one location to the other, constantly checking and rechecking priorities of sessions to be attended, balancing dialogue with listening and 1:1 with 1 to many formats of learning. The day was kicked off by Ester Martinez, and her message was simple – Technology is already changing rules of the game and one needs to take charge, define the problem statement and then use principles of design thinking while designing the solution set. She cited 3 examples to make her point – Chinese company, Broad Group, created a multi-story structure in 19 days. Airbnb handles 80 times more bedrooms per employee than any typical hotel chain. Hyperloop accesses a global and distributed talent pool that works without fixed salary (equity stake is offered) to help them develop the next generation transportation system. All examples of how defining the problem statement help organizations align resources. The keynote included Brian Sommer, Fons Trompenaars, and Frank Ricciardi. In this session, I loved the dance of technology and humans. Brian talked about how companies need to start leverage data residing outside their systems to make people and business decisions. Fons talked about the diversity of diversity. Brian talked about the ubiquitousness of technology and how it is a leveling force which impacts everyone, in the same manner, Fons talked about how people from different cultures react to the same situation differently. This keynote would set the tone for the two days conference and send out a clear message that the magic lies in balancing technology with humans and it’s not about competition but collaboration to perform. After this, there was a tsunami of sessions and I really struggled to juggle the multiple choices thrown at me. While I made choices I was also caught with the anxiety of missing out on something else. For some time it prevented me from enjoying where I was. As I reflected on this, I realized that many times we exhibit the same behavior at the workplace. While we make choices to engage with something that’s happening in the organization, we are constantly intrigued by what’s happening in other “rooms” or silos. In the context of the conference, I had a map, an agenda that told me what was going on there. In the organizational context, many times such map or agenda of what’s happening in other rooms is not evident and that further increases my curiosity or sometimes I grow indifferent to those activities in other rooms. I met individuals who had planted themselves in one room and were completely focused on what’s happening there. Some found it too much work to shuttle between the rooms and hence decided to hang in the middle and spend time with friends and conversations. Some were actively seen juggling priorities and moving from 1 session to another in order to capture ideas from multiple sources. As I was observing all of this, I realized that the design and the theme were in perfect unison. I could see different shades of performance and how people were performing in the context of the conference. This was a very powerful social experiment that I witnessed and it was the biggest learning and take away for me from day 1. I spent most of the time listening to start-ups and focusing on the Spotlight program presentations. I also spent time with some of the exhibitors trying to understand what’s different and new from last year. It was good to see many companies coming back to Tech HR to exhibit their newest and latest offerings. It was also interesting to observe the formats used by these companies to draw attention and engage with delegates at their stalls. The unconference area provided a vibrant setting for discussions right in the middle of all types of technology and represented how conversations are crucial to making sense of everything that’s happening around us. The selfie points placed around the venue were widely used by enthusiasts not necessarily just by the millennials. The exhibition area was huge and it took me most of the first day to ensure that I see and visit every exhibitor to discover what they have on offer. Right at the entrance of the conference were these 27 young HR tech start-ups and entrepreneurs with a mix of recruitment, performance, engagement, assessment and even compensation related tools. The variety of experience of the startup entrepreneurs is what struck me and their enthusiasm towards their ideas was contagious. In the exhibitors there was a wide variety too, with a total of 64 exhibitors it was one of the biggest HR Tech exhibition that I have seen so far. The broad categories that were present: HRMS (end-to-end HR solutions), Recruitment, Assessment, On boarding, Performance and engagement, Payroll, Benefits, learning and consulting. The biggest was recruitment with a dozen companies presenting different solutions in this category and a close second was learning solutions with 11 companies; the HRMS was a close third with 10 HRMS companies vying for attention. The presence of global players in this exhibition further emphasized the importance of Indian market while it was interesting to see Indian companies who are already making their mark in the global markets present at the exhibition. I went back to my hotel room after a good 12 hours on Day 1 at TecHR17 and was looking forward to an even more engaging and immersive Day 2. I think the fact that I could not sleep well on Day 1 was partly because of this excitement that I carried with me. I am convinced that for anyone interested in HR Tech in India this is one event which is an absolute must. As HR Tech Analyst focused on the Indian market, I am grateful to People Matters team for encouraging my endeavors. It was truly a spectacular day 1 of the conference. What have we learned from a decade of Tech Implementation and change management?